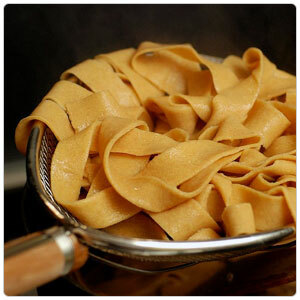 Pappardelle is a 1-inch wide, flat ribbon of pasta. It is traditionally used for rich, heavy sauces and ragu of meat and game. This pastas name comes from the Italian verb pappare, which means "to gobble up". Drop pasta in a pot of rapidly boiling salted water until just cooked. Strain pasta and add to sauce or ragu. Finish cooking the pasta and sauce/ragu together until done. The pasta shape is so popular that in Italy there are towns that have festivals honoring it. For example, a festival called the Sagra delle Pappardelle al cinghiale (Pappardelle with wild boar festival) in the city of Gemmano in the Emilia-Romagna Region is held every August.